I remember when I attended my first ESAi summit. I remember the trouble I went through to get there and I’m pretty sure those around me then can vouch for it too. It was one of the most invigorating and unforgettable experiences of my college years. It was the 3rd annual Summit in Berkeley, CA. I was excited to meet some new faces and see what they hype about these summits were about. I may be biased, but that was my favorite summit. I then went ahead and ran for a position in ESAi and proud to say that I loved each and every moment of it. Fast forward 7 years later, I still hold on to those memories and look how far ESAi has come. 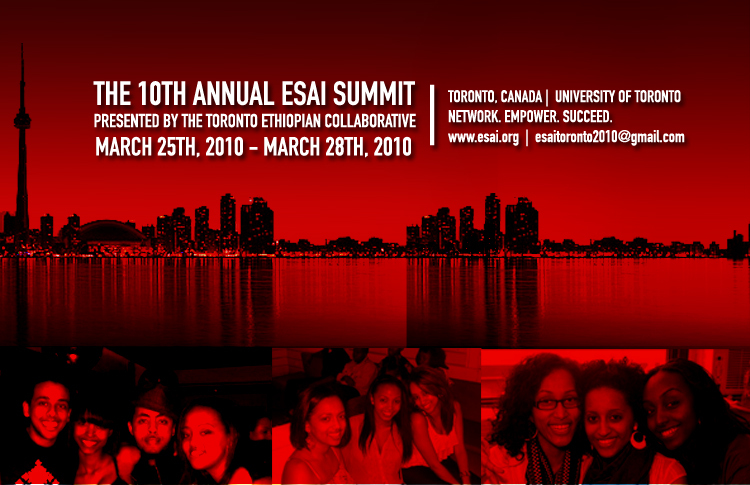 For those of you who are not familiar with what ESAi means, Ethiopian Students Association, International. For the first time, ESAi is putting living up to the “I”. All summits have been held all over the US but never have they crossed the border. It’s great to see that this year’s host are located in Canada. I wish I could make it. The other day I asked Mike Endale whether he was going or not, he said of course. I was sort of worried that we’d only be the “seniors” and not too many to join us, so I’d feel out of place. He also said something poignant. When we used to organize past summits , we were always looking for folks to attend and it would only be right to support their efforts. So if you live in Toronto, or you know anyone who lives in Toronto, please make sure to support these young, energectic individuals who’ve poured their heart and soul in organizing the summit. Following the Summit on Saturday is the Selam Visual Arts Festival. The visual exhibit ranges from photography, oil paintings, motion graphics, textile and digital art and brings together Ethiopian and Eritrean artists from across North America and Ethiopia to Toronto, Canada. This year’s artists will feature : Abye Kifle, Assegid Gessesse, Naz Mebrahtu and Kal Assefa : For more info, please Click Here. Published by beshou March 23rd, 2010	in Noteworthy, Shameless Plug and Social. thank you firends. for this .your articl .but .at this time .im stop.to enything. .im live several ethiopians.inkhartoum . i ve morthan 15 year ago . until. im live.will . but im get .to this cantrey this land .my dearm is al ready .not bring .to real. .so im feel to bad .my emotion .dawen . i nver creat .everthing here .i nver ve .eny olternetiv .by that past 15 years . ago .i lost several gold things. Yehe lij endew! Lebu eskitefa neber megref! i am not being ye bernos police or anything but what did he ever do to you ? If it does not make sense to you just disregard his comments. Even though I only have attended two ESai Summits, I agree the UC Berkeley Summit was one of the best ESAi summit to this day. I can be biased a bit right. Anyhow, mad props to Toronto, even though I was not there to see what took place but do have faith in the youngsters. What I would like to see is Alumnis getting invloved. nol, i remember the very first summit at VCU (the best! )it is great to see that 10 years later, it is still ON!!! I am proud of the youngens in TO, the pics look amazing…and the summits remind me that I that’s where I met some of the most intelligent abeshas I know today! anyways, it beens great to see ESAi start out as fledgling group and to now witness what it is today. the energy is amazing. keep it up, ESAi. is this a networking event? what goes on in these summits, I got some cousins coming up, may be worthwhile to help them connect with ethiopians their age. ESAi sounds like a great concept. I hope this years event was a success. for real gin why is he writing like that again ? Letekilala ewket yahil …? Hey, cool website. I actually came across this on Ask Jeeves, and I am stoked I did. I will definately be coming back here more often. Wish I could add to the post and bring a bit more to the table, but am just absorbing as much info as I can at the moment. Damn, awesome website. I actually came across this on Yahoo, and I am happy I did. I will definately be coming back here more often. Wish I could add to the post and bring a bit more to the table, but am just taking in as much info as I can at the moment.